Two sources I was reading recently referenced this tale, so I thought I would feature it here. Turns out, it's not as easy as it seems-this sad, short little tale was excluded from later editions of the Grimms' Children and Household Tales, apparently including my own copy (which is supposedly the "complete fairy tales"...) and the text is not as easily found on the internet as most Grimm tales. I did end up finding it here. 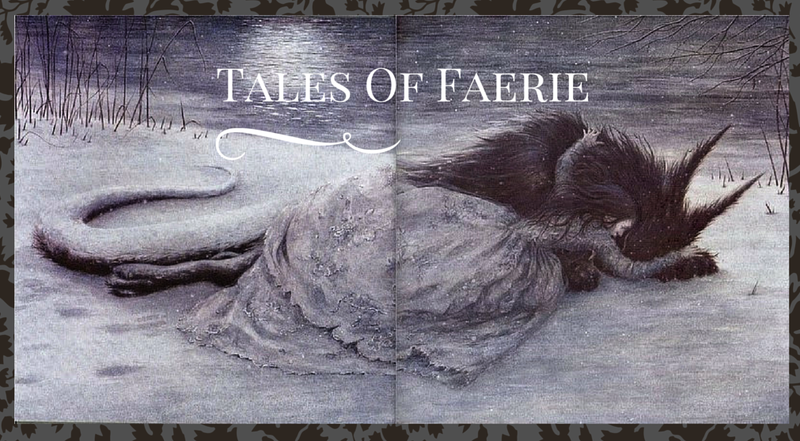 I was going to include comments at the end but found I was at a loss for words...so I'll let the tale speak for itself, but just mention that this tale reflects, like many others, the very real problem of hunger many hearers and tellers of fairy tales faced. "There once lived a woman who fell into such deep poverty with her two daughters that they didn't even have a crust of bread to put in their mouths. Finally they were so famished that the mother was beside herself with despair and said to the older child: "I will have to kill you so that I'll have something to eat." The daughter replied, "Oh no, dearest mother, spare me. I'll go out and see to it that I can get something to eat without having to beg for it." And so she went out, returned, and brought with her a small piece of bread that they all ate, but it did little to ease the pangs of hunger. And so the mother said to her other daughter, "Now it's your turn." But she replied, "Oh no, dearest mother, spare me. I'll go out and get something to eat without anyone noticing it." And so she went out, returned, and brought with her two small pieces of bread. They all ate them, but it was too little to ease their pangs of hunger. After a few hours, the mother said to them once again: "You will have to die, otherwise we'll all perish." The girls replied, "Dearest mother, we'll lie down and go to sleep, and we won't rise again until the day of judgement." And so they lay down and slept so soundly that no one could awaken them. The mother left, and not a soul knows where she is." There is much dark in the old tales, (and much light also). This one is especially sad. I think they were told to ease the pain and to ensure that people did know of the suffering and were grateful for what they had. Not what one would usually expect from a fairy tale, unless one counts cannibalism. Oh, you have THAT translation of Grimm. I remember my first year of high school, I decided to check out Grimm's Complete Fairy Tales, because I hadn't been able to go to the public library for quite a while. The translation at the public library had been the Margeret Hunt one (though it had contained some tweaks to the archaic words to make it more accessible to modern readers, like changing "Grethel" to "Gretel"), which I had enjoyed a lot. Anyway, I went to the High School media center to check out their copy of the Complete Grimm. It was the exact same edition that you have. I took it down off the shelf, flipped through it, and replaced it on the shelf in disgust. In order to contain all the tales, rather than making their own translation, or using the Margeret Hunt one, they randomly selected the tales from various translations. So some of the tales were the Lucy Crane translations, some were Edgar Taylor translations (and thus very censored), and some were from very obscure collections that are hard to find. And even though some of the tales were from the Lucy Crane translation (which is a very good translation) they had been edited by the publisher of the particular book, and censored so that more kids could read them. I couldn't stand it. Maybe I was a little too hard on that book, but I was just disgusted that those publishers would even do such a thing. I'm not exactly a one hundred percent purist, but I think when there's a big book that says, "Complete Grimm's Fairy Tales," one would expect it to be a pretty good translation. Another thing I didn't like was that it didn't have the stories in their original order. I wouldn't have so much of a problem with it if they had at least had "The Golden Key" be the last tale. It's clearly meant to close the collection, and if they had at least included it as the last tale in this edition, I could forgive the rest of the tales being in the wrong order, since, other than "The Golden Key," the order doesn't really matter. And you're right about it not containing this particular story. The titles of collections of "Complete Grimm's" are usually misleading, because they're actually more like "Complete Grimm Final Edition."